The Konica Minolta Group is continually working to strengthen its business and respond to the diverse expectations of society with the aim of increasing corporate value. The Group believes that the essence of good corporate governance lies in being accountable for its actions to all shareholders, investors, and other stakeholders. With that understanding, the Group has established a management structure that responds flexibly to changes in the market environment to allow more timely, appropriate decision-making on important matters. The Group also continues to improve its corporate governance functions to ensure greater management transparency and soundness. To strengthen its management supervisory function, and expedite decision-making by transferring significant authority to the executive officers, the Group has adopted a company-with-committees system. The Board of Directors includes four outside directors, who are highly independent and have no significant business relationships with the Group. The majority of directors do not serve concurrently as executive officers. Moreover, to further ensure the supervisory function of the Board of Directors, a director who is not serving concurrently as president or other executive officer is elected as Chairman of the Board of Directors. 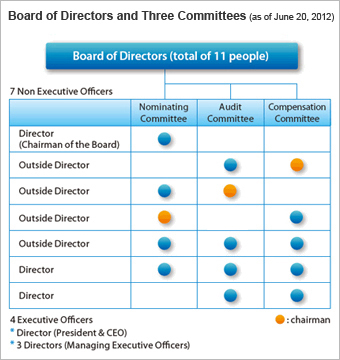 In addition, the company-with-committees system has three committees within the Board of Directors—the Nominating, Audit, and Compensation committees—each of which comprises five directors (three of whom are outside directors). In order to ensure better management transparency, none of the directors comprising the committees serve concurrently as executive officers, and outside directors are chosen to chair each committee.